Syrian Regime Has 'License To Kill' After Diplomatic Impasse, Activists Say : The Two-Way At least 15, and possibly many more, have been killed today in Homs. Over the weekend, about 200 people died in the city, activists say. 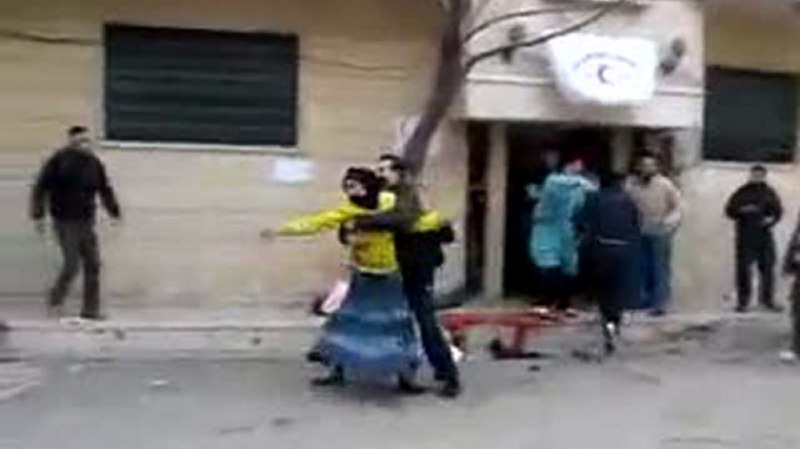 As the killing continues, the U.S. closes its embassy in Damascus. Activists say this image, taken from a video uploaded to YouTube, shows Syrians outside a field hospital in Homs earlier today. Blood stains the sidewalk. Because few foreign journalists are inside Syria, images such as this cannot be independently verified. We're following the day's news from Syria, where there are reports of more attacks by government forces on people in the city of Homs. Update at 9:35 a.m. ET. State Dept. On Why The Embassy Has Been Closed. "As the Secretary told the Security Council on January 31, we continue to be gravely concerned by the escalation of violence in Syria caused by the regime's blatant defiance of its commitments to the action plan it agreed to with the Arab League. The deteriorating security situation that led to the suspension of our diplomatic operations makes clear once more the dangerous path Assad has chosen and the regime's inability to fully control Syria. It also underscores the urgent need for the international community to act without delay to support the Arab League's transition plan before the regime's escalating violence puts a political solution out of reach and further jeopardizes regional peace and security." "The Obama administration has closed the U.S. Embassy in Damascus and pulled all American diplomats out of Syria," the AP is now reporting. "Officials say Ambassador Robert Ford and other diplomats left Syria on Monday. It's the most dramatic U.S. move so far after 11 months of a violent crackdown on dissent by President Bashar Assad's regime." NPR's Michele Kelemen has also confirmed the news with State Department officials. NPR's Andy Carvin has put together a Storify feed of news about Syria. CNN's Rima Maktabi reports on her Twitter page that "17 officials including [U.S.] ambassador Robert Ford left #Syria via #Jordan, in the latest decision to shut down American embassy in #Damscus." People in Homs, Syria, say government forces are shelling the city and that at least 15 to 20 people have died so far today. The renewed attacks follow an even deadlier weekend barrage — human rights groups say government forces killed about 200 people in Homs on Saturday, making it perhaps the bloodiest day since opposition protests began last spring. NPR's Kelly McEvers reported on Morning Edition that activists in Syria allege President Bashar Assad's regime has been emboldened by this past weekend's veto by Russia and China of a U.N. Security Council draft resolution that would have condemned the regime for killing its own citizens. Activists believe, Kelly says, that the veto has "given the Syrian regime what they call a 'license to kill' — to keep on continuing [to attack] protesters and opposition groups on the ground, and that's exactly what we've been seeing over the weekend." Kelly, who is in Beirut, has been speaking with people inside Homs and following news reports about what is happening there. The BBC's Paul Wood, who is in Homs, reports "it was a quiet night until just after dawn, when we started hearing mortars falling - about one every 30 seconds. Some heavy artillery has also been used." "There's been constant shelling," he added. One activist in the city, Abu Abdo Alhomsy, told al-Jazeera early today that "it is horrible right here. Rockets are falling. There are massive explosions that shook buildings. We don't know really what to do." Ahmed Al Omran, a production assistant on NPR's social media desk, is curating news from Homs on his Twitter page. A short time ago he retweeted a report from the opposition Syrian National Council that as many as 50 people may have been killed in Homs so far today. Because there are few independent journalists in Syria — and because those who are there are having difficulty getting out to see what's happening — news outlets are relying in large part on the accounts of sources they reach by telephone and on the videos and blog posts of citizen journalists inside the country.